Today's nails are inspired by a design sent to me by the lovely Jillian N. who is amazingly photogenic. ;) (she'll know what I'm talkin' about) She sent me a picture of her awesome red and white marbling design that she did for Christmas, so I decided to try them myself, but added green into the mixture. BTW, China Glaze Emerald Sparkle, while incredibly gorgeous, is VERY VERY hard to marble. It kept breaking apart into chunks. (you can sort of see what I'm talking abut on the right index finger) *argh! * It took 3 attempts at the nails to get this result, which I finally gave up and accepted, since it was 12:48 a.m., and I needed to wake up in 5.5 hrs. Plus I was in the middle of making raspberry chocolate chunk brownies for the office holiday party today!! :-P mmmm But anyway, sorry its not perfect, but what can ya do, you know? I used China Glaze White on White as a base, with Pure Ice 611 Platinum over top, then marbled with Pure Ice 611 Platinum, China Glaze Emerald Sparkle, and Zoya Isla. I had to add in the Pure Ice 611 Platinum with the colors, otherwise I kept getting a black/brown color. Like I said, this combination was frustrating. I love Emerald Sparkle, but I have a reaaaaally hard time cleaning it off my fingers and cuticles. Topped everything off with 2 coats of the amazing and glassy Seche Vite top coat!! 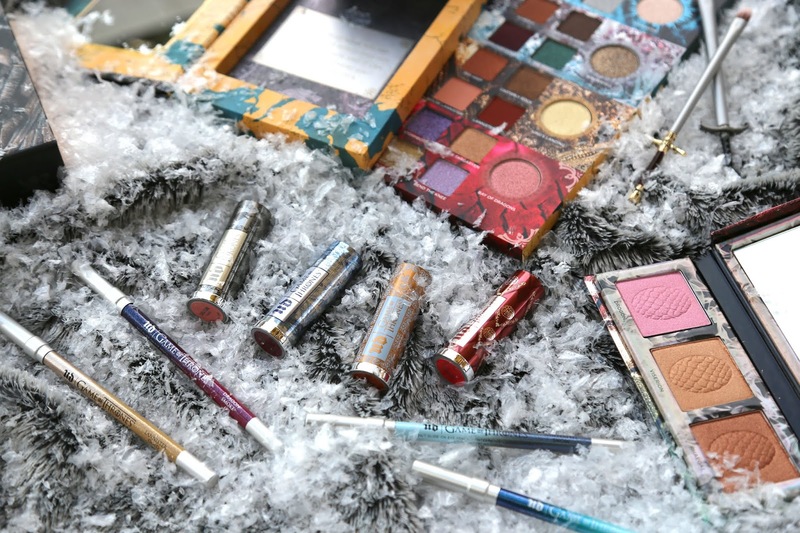 9 more days until Christmas!! OMG the first pic freaked me out. But it looks amazing after clean up! so messy right? 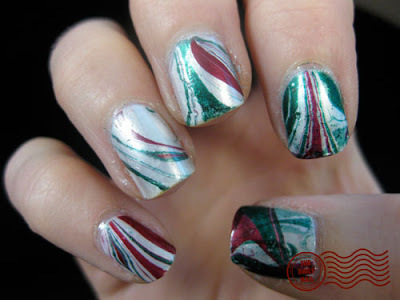 These remind me of peppermint christmas candies! Awesome. how do you marble? i really like it! WOW! That looks so cool! There is a way to avoid some of the mess by taping around your nail with regular ol' tape. I saw it on youtube. I really need to try marbling. they were awesome before cleaning too!!! 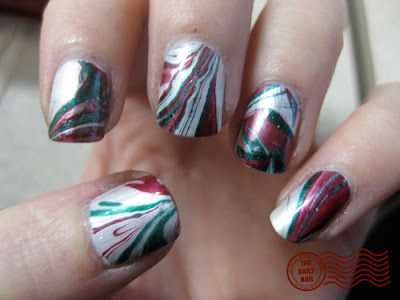 I love marbling, but I use tape around my nails to help keep clean-up to minimum. I love these colors! Good job! Woah. I thought the first picture was the final result. And here I've been, thinking you just get them all perfect on the first try. Had NO idea you do so much cleanup. I feel a lot better. LiAnn- you totally should- there are endless possiblities- and even if you use the same colors as someone else- they'll be different!! Polish'd Cindy & Jackie- thanks for the Tape idea- that will realllllly help lol. I thought about putting cuticle oil on my skin first too, wonder if that'd work. leendaadll- sometimes I get them right on the first go without much on my finger/cuticles, but this color combo was giving me lots of problems. I don't recommend the glitter polishes for marbling, unfortunately. I love those! Definitely going to have to try water marbling. I'd love to see a post of your entire process. :)Like how much time between coats, etc. I love to paint my nails but can never seem to get them to dry without screwing them up or getting bubbles and what not. 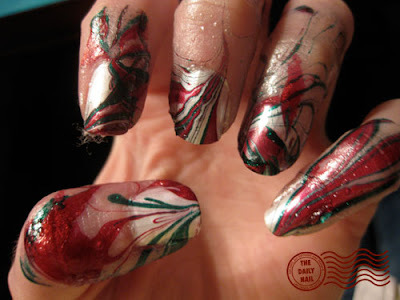 I was wondering how you were doing the marbling without having polish all over your fingers! LOL! You're giving me inspiration to try nail art! I've recently started marbling my nails and found that petroleum jelly around the nails helps significantly with clean up. It's still messy, but it works pretty well. wow! incredible technique you've got going. If you dont want to use tape, you can use Vaseline on the fingers, around the nail before you begin. Do you use a brush to clean up around your nails/cuticles? Looks hideous when not cleaned up!! 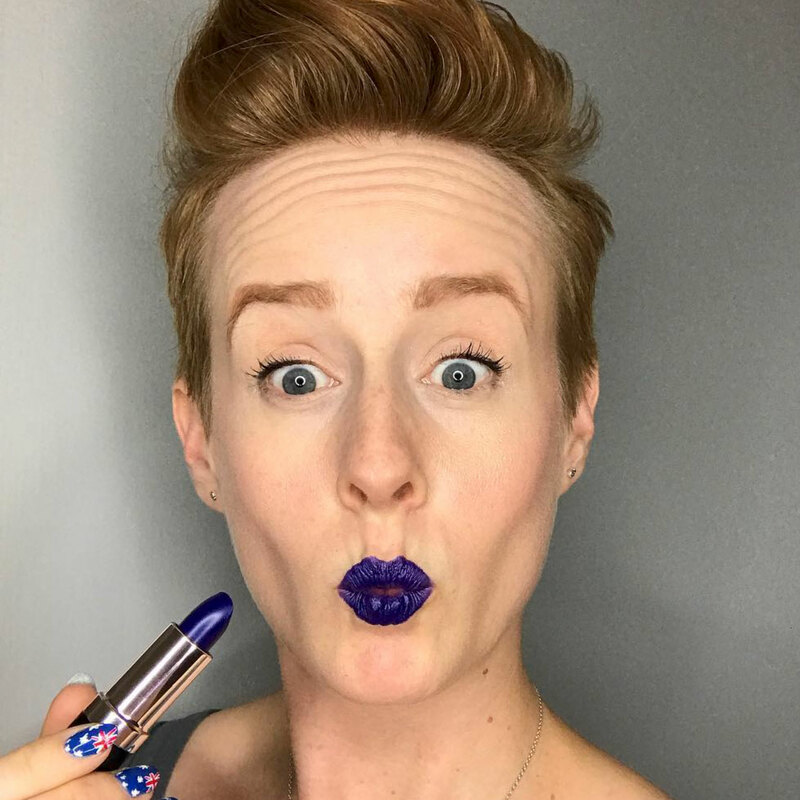 But wow - how effective! Beautiful! That looks really cool. Come to think of it, the design somewhat resembles my 2nd grade Christmas ornament. I always did like that one.